A bunch of awkward adolescents, a former spelling champ turned Realtor, and a comfort counselor on parole, these are the faces that makeup Loudoun Valley’s vibrant production of “The 25th Annual Putnam County Spelling Bee.” With audience member’s sharing the stage, Valley’s immersive piece brought laughs, smiles, and heartfelt aweing. First appearing on Broadway in 2005, “The 25th Annual Putnam County Spelling Bee” takes place in the geographically ambiguous Putnam County, centering on six misfit pre-teens competing to take home the spelling bee gold. Through trials and triumphs, these quirky spellers use unconventional methods to show off their wordy affinities. The cast worked brilliantly as an ensemble, each with standout moments in their own right. Their energy and childlike enthusiasm brought life to the show, the juvenile spellers joyfully contrasting their adult counterparts. The exuberance of the actors worked harmoniously with the equally as vivacious technical elements, making for a fantastically spellbinding whole. The six pre-teen contestants gave hysterically captivating performances. Nick Tortora hilariously captured the awkwardness of puberty in his portrayal of Chip, while Liza Shourds’s performance as Marcy Park gave insight unto the pressures of perfection. As Logainne Schwartzandgrubienerre, Jena McDonald brought childlike enthusiasm to the role with captivating character quirks and physicality, maintaining a believable lisp. Sophie Stapleton’s clear voice and honesty in a juvenile role, brought endearment to Olive Ostrovsky and made hers a performance to remember. Both Blake Carlson and Zach Goolsby, as William Barfee and Leaf Coneybear, respectively, lit up the stage with outlandish and energetic performance, creating lovable and bold character. Although each performer had moments to steal the spotlight, the cast worked brilliantly as an ensemble, not upstaging, but complementing one another. Claire Poirier’s performance as Rona Lisa Peretti brought a sense of maturity, yet playfulness to the show. Her connections with the contestants, as well as her fellow auditor, Vice Principal Panch, portrayed by Henry Trochlil, added honesty to the production. As Michelle Mahoney, Onna Thomas’s voice soared, her strength as a singer made her featured solos show-stoppers. The entire cast worked beautifully together with genuine chemistry, from the opening number, “The 25th Annual Putnam County Spelling Bee,” to the “Finale,” their crisp harmonies and sharp choreography brought incredible strength. The technical aspects of Loudoun Valley’s production thoughtfully complimented one another as well as enhanced the actor’s performances. The simplistic, yet impactful set, designed by Zahl Azizi, captured the essence of a middle school gymnasium in a high school auditorium, his creative use of the double doors added interest to the performance while his set pieces brought symmetry and levels. The white wall backdrop created a blank canvas for Megan Horgan’s creatively colorful lighting designs. Victoria Wright’s costumes and Emily Simpson’s props whimsically enhanced the already playful characters, and choreography by Mariel Clark was well executed, bringing dynamics to the piece. Sound by Devin Flynn and Josh Gilbert was crisp and clean, pulling the audience into the performance without distracting them. Each of these elements proved to be strong individually, while creating a cohesive production overall. 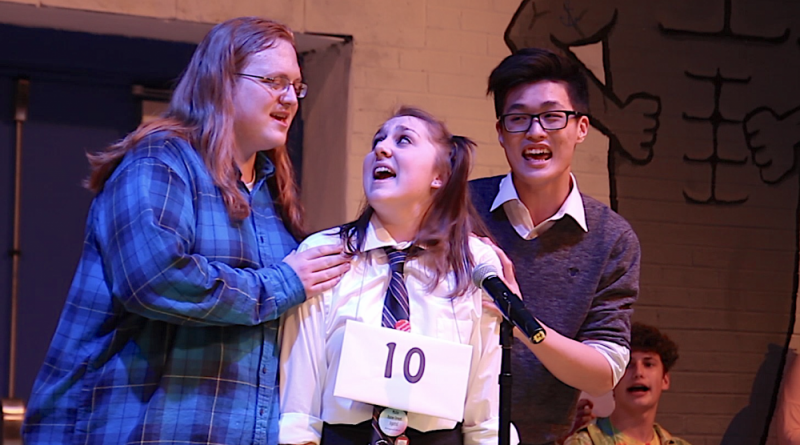 “The 25th Annual Putnam County Spelling Bee” requires an immense amount of energy, commitment, and creativity in order to truly capture the essence of the show, all things that Loudoun Valley High School was bountiful in. With a hilariously dedicated cast and an immensely imaginative design team, they produced a show to remember. Though many would not consider a middle school spelling bee the place to be, Loudoun Valley created one you would be “Woe Is Me” to miss.